You probably came to CSI for data, which is our specialty. You already know that we provide summary end-of-day market data, but did you know how very broad our offerings are? All stocks traded in the U.S., Canada and the U.K. are reported. Options on stock indices, and all futures options are included. Single Stock Futures reflect current availability. The full range of 20,000+ US mutual funds are provided, complete with adjustments for capital gains and dividends. 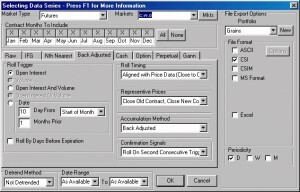 All futures series can be transformed into a multitude of computed contracts. Briese’s Commitments of Traders (COT) data is included in the UA software. Ninety-nine percent of coverage reaches back to the first day of trading for each respective market. Click here to view complete market listings and specifications. Data accuracy is assured with Unfair Advantage, and every customer enjoys the same level of perfection. Errors do occur, but any suspicious data point reported by a customer or discovered by our staff will be subject to careful review and verification. If an error is confirmed, a correction will be transmitted the following day. An independent study featured in Futures Magazine found CSI’s error and omission rate lower than all competing data firms tested. Downloading data is so simple! Just click the telephone icon on the UA toolbar, or update automatically in an unattended mode. You can even visit our website before you download to monitor CSI’s internal posting status of your favorite markets. Unfair Advantage uses a proprietary serial compression (four times more powerful than Microsoft’s Double Space) to hold hundreds of thousands of time series in a relatively small amount of disk space. 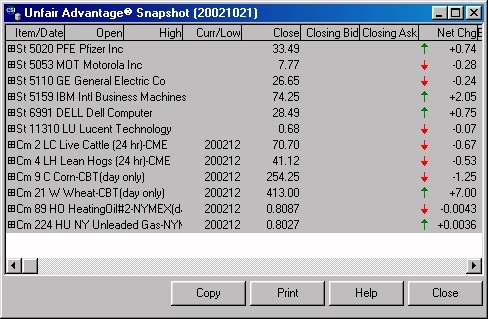 The UA Snapshot is a great way to get an overview of daily closes, volume and the net change for individual issues. Access by your private portfolio or all futures markets at once. Detrend a series to analyze data resources in today’s constant dollar terms. 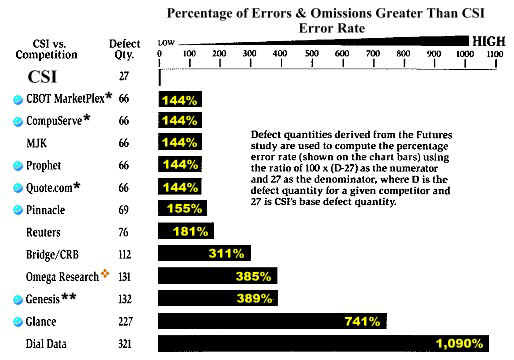 When back testing a trading algorithm or procedure on extended historical reserves, the detrend adjustment eliminates the tendency to treat past history with less weight than it may deserve. Data Splicing and Concatenation are options allowing you to join related data series such as the Deutche Mark and the new Euro into one complete series for analysis and charting purposes. Unfair Advantage comes with software that will transform raw futures contract data for a given commodity into a single continuous series. This forces any futures series comprised of many delivery months into a single series that can be analyzed over an extended period. This type of data is suitable for individual study or for simultaneous analysis of multiple continuous series. A time-weighted Perpetual Contract® data series, which reduces a given futures market into a single continuous series using a constant future-period-forward perspective measured in days and months. A back-adjusted series in which individual contracts are concatenated over time and adjusted by a delta difference (to provide smooth continuity to the data) as each contract rolls from the current month to a more distant month. Delivery months visited may be dependant upon either a given calendar date relative to the start or end of the month or the magnitude of volume, open interest, either volume or open interest or both volume and open interest, etc. Precise roll timing may be controlled according to the availability of delayed volume and/or open interest reports relative to the current trading day. A proportionally adjusted series, which is quite similar to the above back-adjusted series, except that the delta adjustment is done in percentage terms. This minor difference helps to avoid situations where a back-adjusted series might move into negative territory. A proportionately adjusted series cannot move into negative territory, but it can approach zero. A Gann series, in which historical data is transformed into a series comprised of successive historical segments of the same delivery month over successive years. Using this algorithm, the output continuous series becomes a compilation of all July deliveries, for example. A Nearest Future series, which is an artificial contract representing a concatenation of successive contracts over time, reflecting the price, volume, and open interest of the Nth nearest future. In this option, there is no attempt to account for step-size jumps or drops in price as contracts change from one to another. Unfair Advantage is designed around one or more user-defined portfolios representing the various futures, stocks, funds, options, etc. you wish to actively follow. 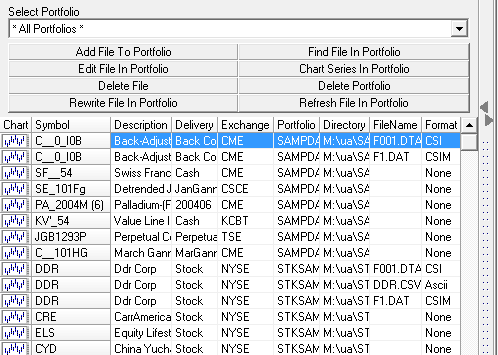 The value of a portfolio to the UA user is that all of the items in all portfolios are conveniently grouped and export files are automatically updated at data distribution time. 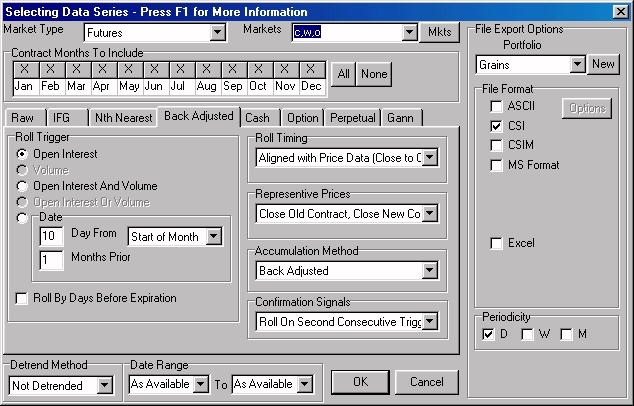 Your specifications for the computed contracts are stored in your portfolios, along with format and reporting frequency (daily, weekly or monthly) requirements for export files. Portfolios are designed to facilitate file appendage whenever possible, but will totally re-create files from scratch whenever necessary. Portfolios make it easy to access charts and studies that may be important to your market interests. Portfolios also make it easy to use UA as the data source for multiple analysis products. Displaying Charts in any Currency: Since UA can process market data from over 80 international futures exchanges that involve multiple currencies; it often becomes necessary to view multi-national products in regional terms. UA can easily make the conversion by displaying market movement using currency cross-rates. 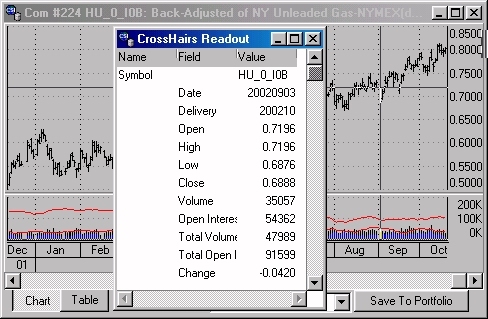 Displaying Charts by Contract Value: A typical UA commodity price chart is presented in price per pound, barrel, ounce, ton, bushel, etc. UA allows such a chart to be presented in full contract value in any currency, which is quite helpful in assessing risk and exposure. Semi-Logarithmic Scale Presentation: A chart covering an extreme range of values may sometimes benefit from a scale change. Convert from a Y-scale linear presentation to a Y-scale logarithmic presentation with a few clicks of the mouse. Every user of Unfair Advantage can see not only today’s summary data reports, but may also review the extensive history of any series in chart form or as a numerical table. Charting with UA is arranged to assist the analyst in comparing one market with another, and lets you simultaneously display studies superimposed over the data. There are many ways in which one might present a chart: The bar frequency of any given time series can range from daily, weekly, monthly or quarterly to annually. 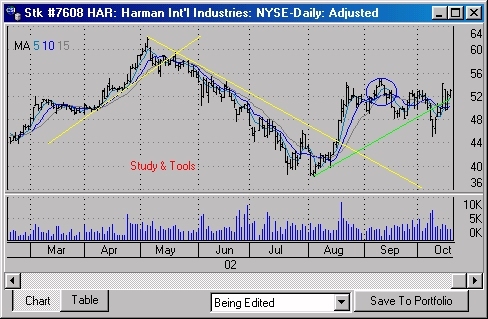 Trend lines may be drawn in selected colors, and the charts may be annotated. Study curves may accompany the pricing data, and can be color-coded as preferred. You can choose to display the data points as OHLC bars, candlestick, or stepped lines. Use the “Study Tools” menu or right-click your mouse to reach these features. Click here to view the complete list of studies and indicators that are provided. Available only to subscribers of CSI futures option data, this study graphically presents a band around a price chart of any given market that supports option trading. For each output, the put premium is added to the close and the call premium is subtracted from the close. The study reveals expected volatility limits for the underlying time series, which lie between the put and call lines. An advantage of this presentation is the implication of knowing whether buying an option may be less expensive than invoking a protective stop. Unlike competitive seasonal tools, UA’s Seasonal Index Study depicts seasonal tendencies by employing forward-looking analysis for individual markets. It is unbiased in that it does not use the future to force the index to appear like the past. UA’s Seasonal Index is cumulative – based upon daily increments of data by adopting a 251-trading-day year. 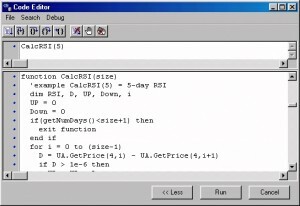 This unique formulation allows it to learn over time. The statistical nature of this study makes it a helpful tool in predicting future market movement. A highly informative set of documents is provided within UA, including a Market Factsheet and the Event Calendar. Each of these is accessible through UA’s Database menu. Rare, but important historical facts concerning particular markets are readily available for students of the markets. View the online factsheet for a full census of all possible choices that CSI reports. Sort by exchange, CSI number, symbol, name, trading units, trading currency, etc. 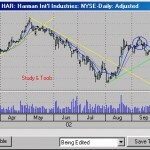 to uncover important details about the inventory of markets. The Holiday Calendar tracks world holidays that may affect any given market. 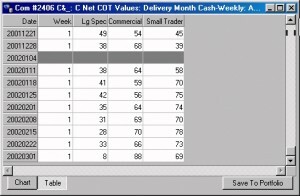 Steve Briese, editor of the Bullish Review, has compiled a unique database of the weekly COT data. The CFTC reports on the open interest positions of large and small traders for all regulated commodities, and this market sentiment is known to be an indicator of future market movement that favors the larger commercial interests. Also included are the COT indices Mr. Briese has created for each market to simplify interpretation. 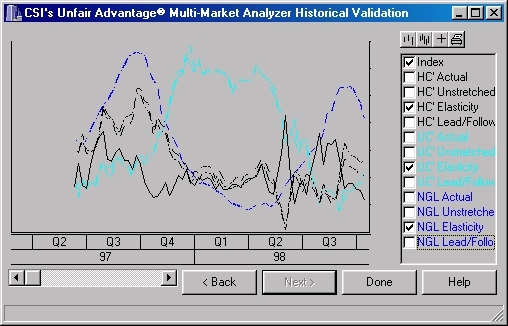 Many Unfair Advantage users make trading decisions based upon customized technical analysis. Others rely on technical trading systems they have purchased to generate buy and sell signals. In either event, such systematic procedures can now be investigated in advance of committing funds to the market. 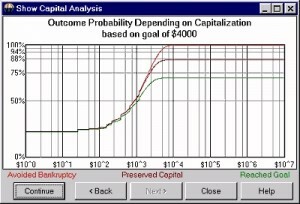 TSPE is a Monte Carlo Simulation that will interpret your actual, simulated or projected track record and determine whether you have a chance to achieve a pre-set monetary goal before exhausting your capital stake. Too often, the success of a trading system depends heavily upon the experienced trading sequence of profits and losses. Rare windfalls can make an otherwise poor result appear to be a great trading system. Since TSPE randomizes the mix of profits and loses under the assumption that each profit or loss is an independent outcome, the result becomes much more believable. This tool is FREE to all UA subscribers, and should be used before embracing any trading system. 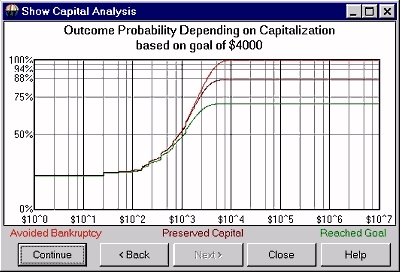 By thoroughly examining your proposed trading approach, you will know how much capital you must put at risk to accomplish a given likelihood of fulfilling your goal. the capital you are willing to place at risk. In cases where you may have purchased a trading system, request the developer supply a trade-by-trade record so that you can apply those facts in advance and determine what TSPE says your capital stake and profit goal might be. TSPE will calculate and quantify your chances of repeating that actual or simulated experience. 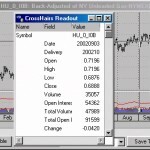 This analysis product is designed to help you trade many markets as a correlated group. It functions as a natural tool for evaluating market dynamics. MMA statistically determines which markets are leaders, which are followers, which are correlated and which are redundant. Then it lays out its understanding of the current econometric picture with an emphasis on probable direction. 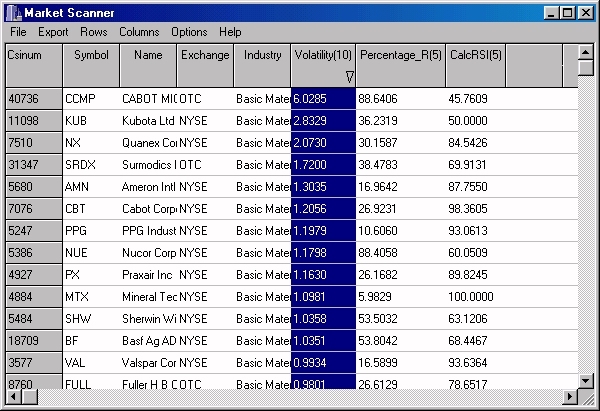 Access it through the Trading Tools menu and identify your desired group of markets. 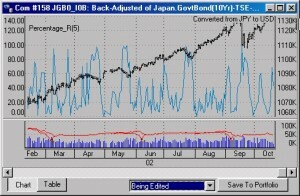 This tool enables the trader to write custom indicators and studies to follow and predict market action. 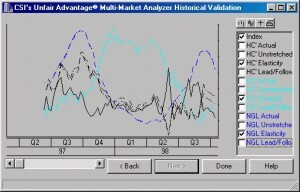 The analyst can capture market statistics on stocks by exchange identification (NASDAQ, NYSE, AMEX, all mutual funds, etc.) 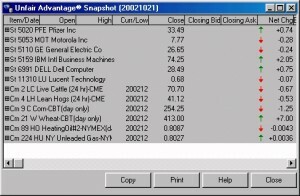 to sort and filter this data to reveal a list of stocks or commodities that meet a particular criterion. For example, one might want to reduce a list of stocks down to all stocks that are priced between $10 and $20 per share, or all stocks which have just risen by over 25% in a single day, or all stocks that have just broken out of a 5 or 10-day low or high. 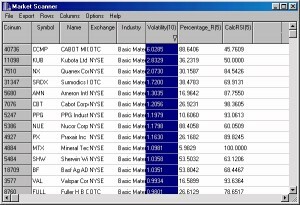 The Market Scanner offers a very simple way to examine large volumes of data with relative ease. 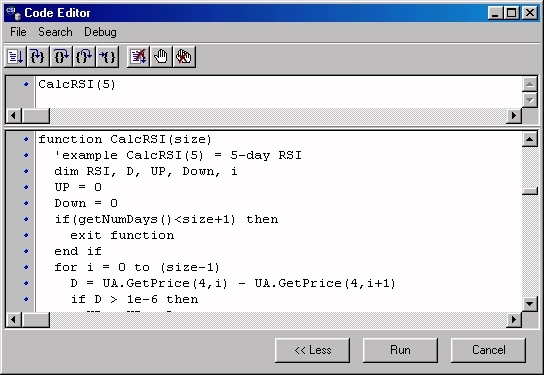 Your indicators can be written in VisualBasic or Perl, both of which are built into the UA product. accelerating upward or downward market movement. There is much that the UA analyst can do to expand on this capability to identify potentially profitable opportunities, or one can simply use the tools supplied to create useful original studies. At any time, press the <F1> key for a popup help screen about the current feature. 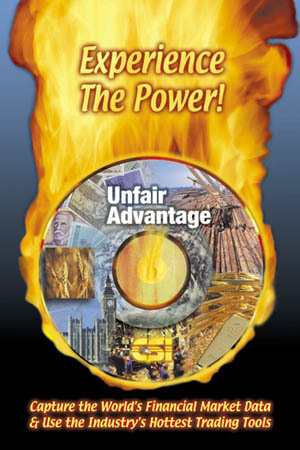 Everything mentioned here is explained fully in Unfair Advantage’s online manual, which you can read and search from the on-line Help menu. Please call CSI’s marketing staff to have all your questions answered and to start your subscription today. We look forward to hearing from you soon! Sales is available weekdays 9am – 5pm ET. Support is available weekdays 8:30am – 9pm ET. Order Online and Get Started Now!